Invest Health is a new initiative, funded by the RWJF and Reinvestment Fund, developed in 2016 that brings together diverse leaders from mid-sized cities across the nation to develop strategies that will leverage private and public investments designed to improve neighborhoods that are facing the biggest barriers to health equity. The Iowa City team is focusing efforts on developing a comprehensive plan to address asthma and mental health challenges in low-income neighborhoods. The Iowa City project includes forming a broad stakeholder group with members from the health, housing, public health, banking, education, mental health, and private sectors. 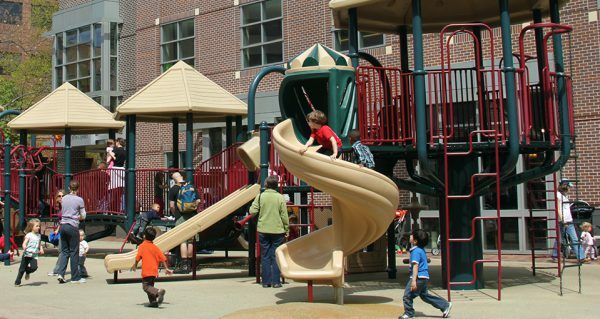 The project is tasked with developing a comprehensive plan including a pipeline of projects and potential funders to improve housing and health in three specific Iowa City neighborhoods. This seminar will report progress made to date on this project and next steps. Iowa’s small towns may not appear to have much in common with a large city like Baltimore, but rural and urban areas are facing some similar health challenges. Iowa, too, has seen significant increases in opioid use. Opioid overdoses killed 61 Iowans in 2015, more than double the number from 2005, according to the Iowa Department of Public Health. Wen will discuss this and other public health issues when she delivers the Hansen Distinguished Lecture, “Lessons from Baltimore: The Intersection between Public Health and Physician Activism,” on Wednesday, April 19, at 12:30 p.m. in Callaghan Auditorium (Room N110), College of Public Health Building. The event is free and open to the public. The University of Iowa College of Public Health named Wen the recipient of its 2016 Richard and Barbara Hansen Leadership Award and Distinguished Lectureship in recognition of her leadership in improving well-being and reducing health disparities. To combat opioid overdose in Baltimore, Wen issued a blanket prescription for the opioid antidote, naloxone, to all 620,000 city residents. Since 2015, this program has saved over 530 lives. Under Wen’s direction, the Baltimore City Health Department has implemented a number of innovative health programs, including B’More for Healthy Babies, which has resulted in a 38 percent reduction of infant mortality in just seven years; Vision for Baltimore, an initiative to provide glasses to every child who needs them; Safe Streets, a program to engage citizens and hospitals in treating gun violence as a contagious disease; and Healthy Baltimore 2020, a blueprint for health and well-being that enlists all sectors to achieve the ambitious goal of cutting disparities in half in ten years. Wen points out that health disparities affect both urban and rural populations. “The challenges might seem different, but it comes down to social determinants of health,” Wen says. Examples of social determinants include access to health care services, exposure to crime and violence, availability of safe housing and local food markets, quality of education and jobs training, and transportation options. In other words, where you live has a big impact on your health. 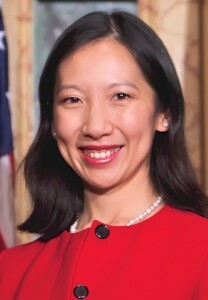 Before her appointment as health commissioner in January 2015, Wen was an attending physician and director of patient-centered care in the Department of Emergency Medicine at George Washington University (GWU). As a professor of emergency medicine at the School of Medicine and of health policy at the School of Public Health, she co-directed GWU’s Residency Fellowship in Health Policy and co-led a new national collaboration on health policy and social mission with Kaiser Permanente. Wen is also the author of the critically acclaimed book When Doctors Don’t Listen: How to Avoid Misdiagnoses and Unnecessary Tests, and has recorded several popular TED and TEDMED talks on patient-centered care, public health leadership, and health care reform. The Hansen Leadership Award is presented annually by the UI College of Public Health to honor individuals who have made sustained contributions in the public health field. The award recognizes exemplary leadership, high ethical standards, and an enduring commitment to improving health on a national and international level. The award is made possible by a gift from Richard and Barbara Hansen of Iowa City. 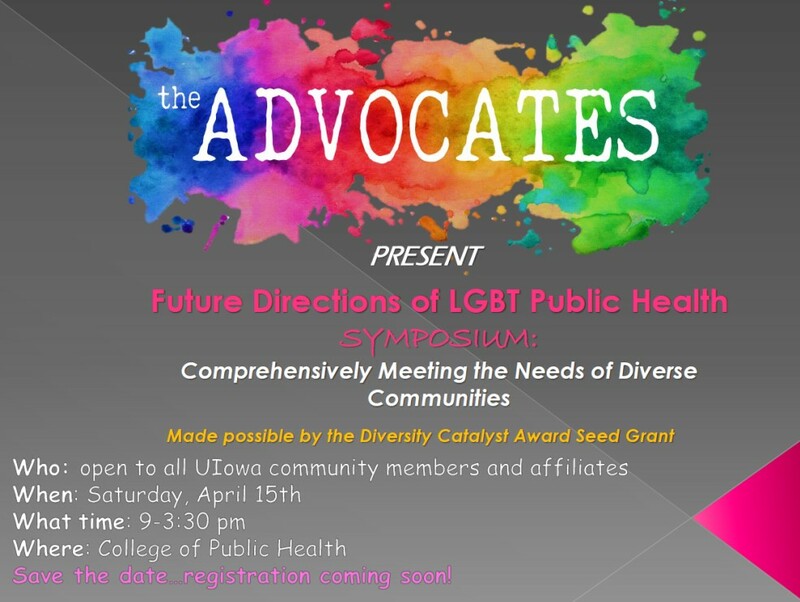 The Future Directions of LGBT Public Health Symposium will be held Saturday, April 15, from 9 a.m. to 3:30 p.m. in the College of Health Building. The event is open to all University of Iowa community members and affiliates, and is made possible by a Diversity Catalyst Award Seed Grant. Attendees will learn about contemporary topics impacting diverse LGBT communities. Light breakfast and lunch will be provided. This event is open to all. Registration is not mandatory to attend, but is required for lunch. For any questions, please contact CPH-LGBTAdvocates@uiowa.edu. Individuals with disabilities are encouraged to attend all University of Iowa-sponsored events. If you are a person with a disability who requires a reasonable accommodation in order to participate in this program, please contact the College of Public Health in advance at 39-384-1500. A partnership of the City of Iowa City, the University of Iowa, and local community development officials has been selected to take part in Invest Health, a new national program aimed at transforming how leaders from mid-size American cities work together to help low-income communities improve health by addressing the conditions that drive health, including access to safe and affordable housing, places to play and exercise, and quality jobs. Iowa City was selected as one of 50 mid-sized cities, from more than 180 teams from 170 communities across the nation that applied to the initiative. The Iowa City team, comprised of representatives from the University of Iowa Colleges of Medicine and Public Health, the Housing Fellowship, the City of Iowa City, and Iowa City’s City Council, was selected for the program by Reinvestment Fund and the Robert Wood Johnson Foundation. The team will receive a grant of $60,000 to reduce disparities in asthma, depression and behavioral health concerns in children and adults living in low-income households. Iowa City’s projects will explore a broad range of ideas including reviewing financial incentives to support new affordable housing projects, developing peer support programs, and expanding existing community efforts such as the Frequent User Service Enhancement (FUSE) project, which aims to reduce public costs by stabilizing chronically homeless individuals. Project teams from across the United States will travel to Philadelphia for a kick-off meeting on June 7 and will meet regularly to share what they’ve learned throughout the 18-month project. The information will also be made available on the project’s website at www.investhealth.org. Project teams will also engage a broader group of local stakeholders to share knowledge and expertise. For more information, contact Tracy Hightshoe, City of Iowa City Neighborhood Services Coordinator, at tracy-hightshoe@iowa-city.org or 319-356-5244. 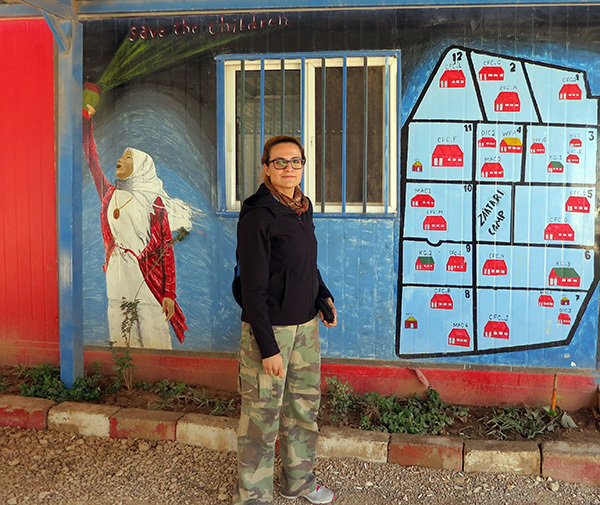 Alumna Tala Al-Rousan (MPH ’15) uses her public health training to understand and address the health needs of Syrian refugees and other vulnerable populations around the globe. When Tala Al-Rousan was training to be a doctor, she often stumped her professors with challenging questions. Social activism and the health of vulnerable populations have always been important to Al-Rousan, who grew up in Jordan and earned her medical degree at Cairo University in Egypt. As a medical student, she engaged in many public health initiatives, including raising awareness against female genital mutilation in Egypt and promoting breast cancer screening education. After receiving her degree, she joined Doctors without Borders as a medical officer and served in Yemen for several months before she moved to the U.S. in 2011. Her husband’s job then brought her to the University of Iowa, where she enrolled in the MPH program in epidemiology. “Data is the most powerful tool. I wanted to be equipped with the necessary tools to do quantitative research that would inform policies,” says Al-Rousan about her program choice. At the UI, she conducted research with Robert Wallace, CPH professor of epidemiology. She also researched Iowa prisoners’ health needs and participated in the Obermann Graduate Institute, a weeklong interdisciplinary program in which UI graduate students explore how public engagement can enhance teaching, research, and creative work. Al-Rousan is currently a Lown Scholar at the Harvard T.H. Chan School of Public Health and a project coordinator at Harvard Humanitarian Initiative. The Lown Scholars Program was established in honor of Dr. Bernard Lown, a Nobel Peace Prize laureate and a world-renowned cardiologist and activist whose career has advanced public health globally. Al-Rousan is researching the impact of the Syrian refugee crisis on the health of refugees in Jordan, as well as the health of the host country’s population. Since the conflict in Syria began in 2011, more than 4.8 million Syrians have sought refuge outside their home country, with millions more displaced within its borders. The United Nations has called the situation the worst refugee crisis since World War II. 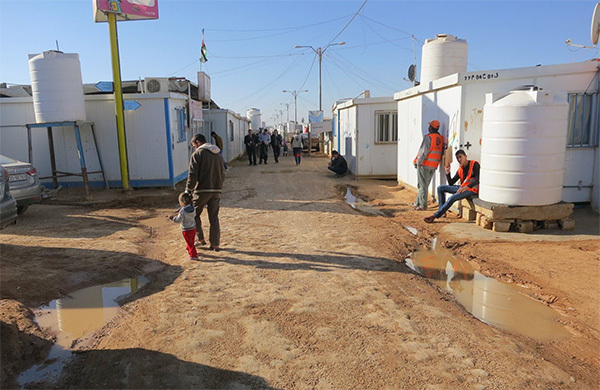 Jordan, which shares borders with Syria, is providing asylum for an estimated 640,000 refugees, presenting significant humanitarian and economic challenges to the small country of limited resources. 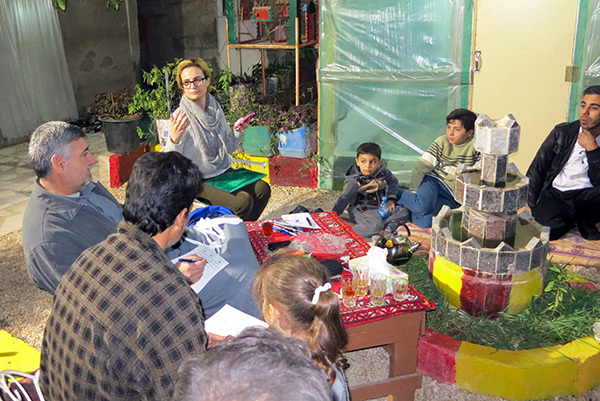 In late 2015, Al-Rousan spent two months in northern Jordan, where she interviewed officials from hospitals, non-governmental organizations, and the Ministry of Health about refugees’ health issues. 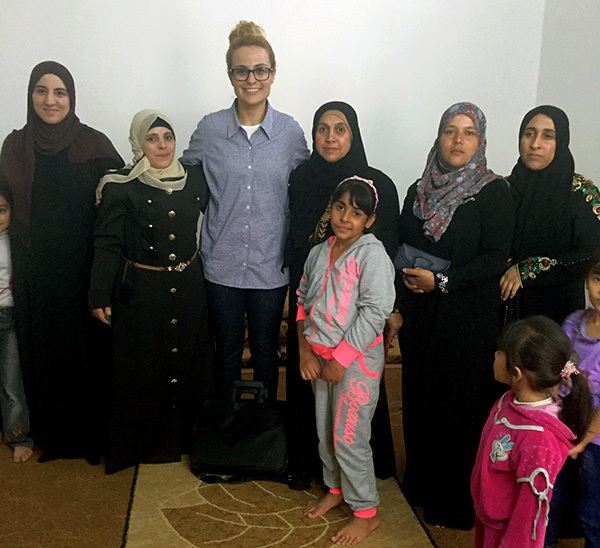 She also conducted focus groups with refugees at Zaatari, the largest refugee camp in the Middle East. She used the information to develop a questionnaire for refugees so they could rank their health concerns. Al-Rousan and her colleagues are currently analyzing the data to determine what the most pressing health concerns are to help guide priorities and allocate resources. A second phase of the project will use these findings to craft a public health intervention that would lessen the impact of this crisis globally. “It’s like a big city,” Al-Rousan says of Zaatari, which houses roughly 80,000 people. 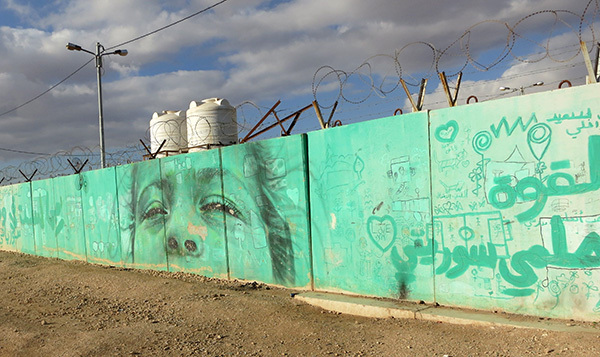 The camp has streets, schools, hospitals, a thriving (but unauthorized) market, tents, and trailers — all surrounded by razor wire-topped fences and guards. Services are unevenly distributed, and about 1 in 3 children don’t attend school. Residents can’t leave without permission and aren’t authorized to work in Jordan, meaning many refugees have little to do but wait and hope they can return home someday. “There are many health issues affecting this population, such as disease outbreaks, high rates of infant mortality, and others,” notes Al-Rousan. Non-communicable diseases are the leading cause of death and remain difficult to manage. At the same time, measles, tuberculosis, and other diseases are re-emerging. The preliminary results from Al-Rousan’s research show that the burden of Syrian refugees is destabilizing an already strained Jordanian health care system. Jordan can no longer afford to pay for refugees’ health care, so chronic diseases are inadequately treated. There is also widespread stigma around seeking mental health care, even though “mental health issues are very common in war-affected communities,” Al-Rousan says, adding that both children and adults have experienced immense trauma. Building partnerships among different sectors was very important to her research, but very challenging, Al-Rousan says. Being fluent in Arabic helped significantly, as was her familiarity with Jordan. Equally important was “getting the government’s blessing and help” with the project, she says. Al-Rousan’s research assistant, Zaker Schwabkey, who is based in Jordan, had many helpful personal connections as well. As for future steps, Al-Rousan plans to apply the research to refugee camps in other countries that share the same amount of refugee burden, such as Turkey and Lebanon. Public health translates across borders, something Al-Rousan urges students and practitioners to remember. “You can still do global heath inside the United Sates. It doesn’t have to be outside the U.S.,” Al-Rousan says, citing work with homeless populations as one example. She also stresses the value of public scholarship and community engagement, as well as keeping in mind the human stories behind the research.